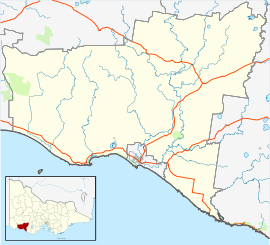 Macarthur (/məˈkɑːrθər/) is a town in the Western District of Victoria, Australia on the Hamilton-Port Fairy Road. It is in the Shire of Moyne local government area and the federal Division of Wannon. At the 2016 census, Macarthur and the surrounding area had a population of 522. Macarthur Post Office opened 1 January 1862. The town in conjunction with neighbouring township Hawkesdale has an Australian Rules football team competing in the Mininera & District Football League. Golfers play at the course of the Macarthur Golf Club on Hamilton Road. Macarthur is also the site of the large Macarthur Wind Farm, completed in 2013. ^ a b "206 Census QuickStats Macarthur". Australian Bureau of Statistics. Retrieved 2 March 2019. ^ Butler, S., ed. (2009). "Macarthur". Macquarie Dictionary (5th ed.). Sydney: Macquarie Dictionary Publishers Pty Ltd. 1952 pages. ISBN 978-1-876429-66-9. Wikimedia Commons has media related to Macarthur, Victoria. This page was last edited on 2 March 2019, at 00:47 (UTC).